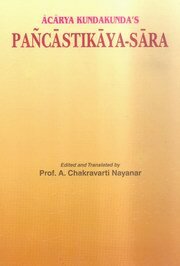 Here is presented a new edition of Acarya Kundakunda's 'Pancastikaya-sara' in Prakrit, edited with translation and commentary by Prof. A. Chakravarti. It is a work of great authority for understanding the Jaina concept of Ontology and Anekanta. Prof. Chakravari's philosophical and historical introduction is valuable in as much as it explains the Jaina concepts in the perspective of western philosophy. The book has been presented to critical readers in its present form by Dr. A.N. Upadhye. It should be welcome to all earnest students and readers of Indian philosophy.